Here’s the perfect recipe that can be served hot or cold, for a meal or for a snack, is super easy to make, and is so delicious you’ll find yourself making it again and again. This recipe uses basic ingredients including easy to make Foreman Grill boneless skinless chicken breast found right here. It’s nutritious, low fat, and you can make several and save for a healthy lunch at the office, or even pack in a picnic. The possibilities for this grilled chicken wrap are endless. Start with this easy to make basic recipe and add your own flair as you see fit. Prepare the boneless skinless chicken breast on your Foreman Grill and set aside. 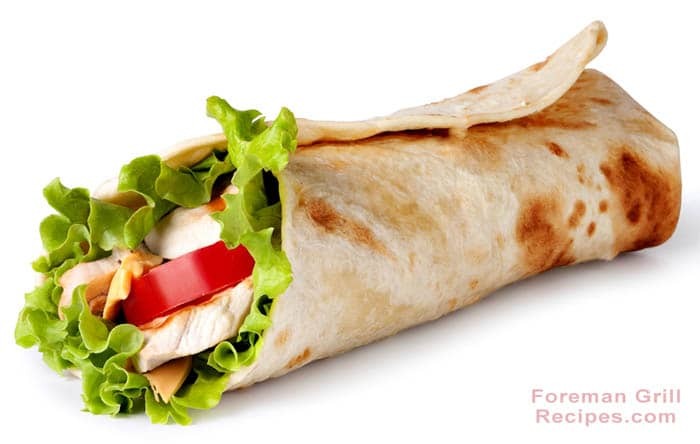 Lay tortilla on a flat surface and add lettuce, tomato, pepper and chicken in a strip down the center of the tortilla. Fold the bottom up about 2 inches. Fold one of the sides over the ingredients and then roll entire thing up tightly. They are now ready for the grill or you can save for grilling later. Preheat your electric grill for at least 5 minutes with the lid closed. You can spread a very small amount of vegetable oil on the tortilla if desired but it’s not necessary. Place on grill and close lid. It only needs to grill for 2-3 minutes to get nice grill marks on the tortilla. Then it’s done! Open tortilla and add some ranch dressing or just pour some right in the top. This recipe is also wonderful served cold. After grill the wraps, wrap them individually in aluminum foil and refrigerate. Other suggested ingredients include adding: avocado slices, almond slices, green grapes.